Southern California boasts the Los Angeles Kings and the Anaheim Ducks who have both recently etched places in history with Stanley Cup victories within the past decade. But SoCal is no hockey town. The Dodgers, Lakers, Clippers and Angels steal the show. As a Los Angeles native, I’ve never had the experience of growing up skating outdoors in my backyard. I grew up playing t-ball, basketball and tennis. There was an ice rink 10 minutes from my house, but my friends’ birthday parties, I was that kid hanging on to the side railing for dear life. To this day, I don’t even know how to ice skate. So it should be no surprise that, for the majority of my life thus far, I’ve had no interest in hockey. In my mind, I wrote it off as boring. Nothing can beat monster dunks, ankle-breaking crossovers and half court heaves. The first hockey game I really closely watched was on Feb. 28, 2010: U.S. vs. Canada playing for the gold medal in the Vancouver Winter Olympics. America lost, 3-2, but it was a nail biter. It went into overtime and the passion displayed on the ice was intense. I thought to myself, “This sport isn’t as bad as I thought.” However, because the Winter Olympics are only once every four years, I never truly picked up on hockey. Then, this year I started watching the Kings and the Ducks. And I’m glad I did. Hockey is an entirely different world. Between the penalties and the fights, I have yet to learn every facet of the game in-depth. But I’m into it. If hockey happens to be on, no matter who is playing, I’ll watch. This is the first NHL playoff season that I’m keeping tabs on, and I’m actually having a lot of fun with it. Since before I can remember, I’ve been glued to the NBA playoffs, and I know there’s a debate over whether the NBA or NHL have better playoff series. My opinion is that both are worth watching. They’re two different sports with equally athletic players. 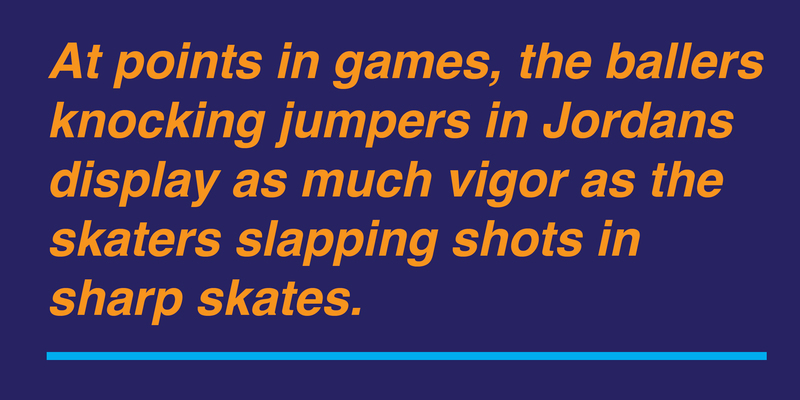 At points in games, the ballers knocking jumpers in Jordans display as much vigor as the skaters slapping shots in sharp skates. To the NBA fans: If you have never appreciated the game of hockey, give it a chance because you’re missing out. And to the NHL fans: If you say you hate the NBA, watch this clip and try repeating that statement.